-Mike Rob Gideon and "Tommy the Truck" are friends from a community football league run through the school (He also has Rob Mike and Gideon as classmates). -Giselle is friends with Rob through their mothers (https://selkiecomic.com/comic/selkie352/), and friends with Tony and Mike through him. Also a classmate. -Lynni is Gideon's fraternal twin sister. She's in class with Sandy and Wu. Knows the rest through her brother. 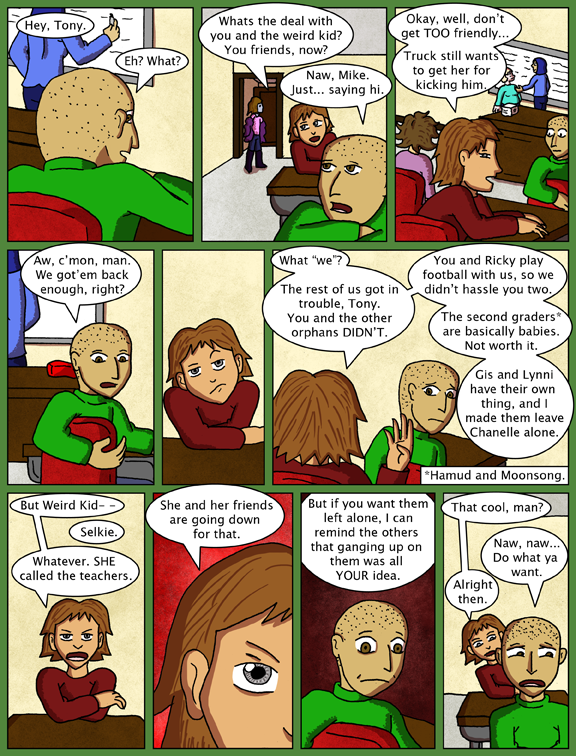 Sometimes it’s really hard to read this comic because of how annoyed I get at the bullies and the failure of a school system you’ve created. I suppose that’s a…compliment to your writing? Mike’s attitude is not entirely unlike a bunch of people I could name in real life. Children are born completely selfish, and selflessness has to be learned. Whether you want to take a spiritual view of that or say it’s an evolved instinct thing, it’s just a plain fact. The “natural innocence” of children has a dark flip side that a lot of people forget (or later refuse to acknowledge for one reason or another) as they grow up, and makes them incapable of writing realistic child characters. Dave is one of those rare writers that is completely in tune with how children really think and is willing to portray them as exactly such. Tony’s got feet of clay. Or do you mean he’s actually a golem and has literal feet of clay? Wow. This school is positively Machiavellian. Calling Giselle “Gis” is kinda…gross. Hey Dave? There REALLY needs to be a like button. It depends on how you pronounce her name. Is it GEE-sa-la, or is it Ji-sell? I feel like the bullies are acting out of scorn. There could be a change in tone if they ever find out just how much Truck hurt Selkie. All they seem to know is Selkie kicked him, got sick, and then they got in trouble. Truck’s had all week to make his point of view the “real” version. A while ago I took a vacation from a comic because it went too dark for me to enjoy. You’ve managed to reach that. I’ll put you back on the list in a few months when the storyline has advanced enough for it to be fun again. Sorry. It is a tribute to your writing. I understand. I didn’t even realize until I went back to look at the bully kid’s in past strips for drawing reference that this whole scenario has been going for a year in real time now. I’m eager to conclude it and move on to other storylines. The disputant ability of a young Victor Von Doom. And less conscience. You are in grave danger. By bringing down justice on the heads of criminals, the criminals now want your blood. Come with me. You’re a lot safer in space. 20 votes. ‘citing isn’t it? This does seem to be a school where many things are overlooked or ignored. They may have learned from experience that trying to help either gets them in trouble too, or they get ignored and nothing happens. That has a tendency to shut someone down. interesting idea, although it would still make things a little weird that not one kid has told their parents about what happened, you are telling me that in this universe not one kid thought “welp, I better tell someone about this” because all the parents are too disconnected with their kids life? on a group of, Idunno 20 kids??? it seems a little unfeasible. I get the impression that it’s a clique of the “reinforcements”, the ones that got in trouble and were specifically recruited by Truck, who are the conspirators. Everyone else other than the orphans is just oblivious to what’s going on because the conspirators are deliberately trying to avoid getting caught for anything. It also has shades of “Us vs Outsiders”, which is a very primitive style of thinking that would be completely in line with young kids’ thought patterns. And something they could have picked up from any number of sources from the grown-up side of things. I didn´t catch that from the story, but it could be the case, mind you it still seems a little one sided thinking that no one has said anything against the idea but well, we can´t read minds. I have to agree with you there. Yes there are always a bunch of clique-y kids that influence and taint others around them, but there is a line drawn. My daughter was 3 years old when she would yell at people to “Stop hurting her/him.” I even had parents who saw that happen and came up to tell me how great they thought it was that she stuck up for others that way. When she was 4, when she saw boys being ostracized (like girls telling boys they couldn’t play with them because he’s a boy) she would actively go over to that boy and say “I want to play with you” and hang out with them. And this is not exclusive to my daughter, because I’ve seen other children do the exact same thing and in different age groups. The group of non-orphans are being drawn as too one-sided in my opinion. Maybe some fear retribution if they tattle, but it seems like the children here are all too one-dimensional in their behavior, especially allowing a thug like Truck to be their unpunished leader. Kids are cruel, selfish and generally speaking totally lack empathy. They will tear a classmate apart for even the slightest difference. They wear glasses. They’re overweight. Or, oh yeah, THEY DON’T HAVE PARENTS. None of this surprises me. Anyone who thinks “kids would never do that” clearly hasn’t spent enough time around kids. And the fact that most of this is going unnoticed is no shock either. There’s probably 1 teacher for every 25-30 kids in that school. They can’t watch all the kids all the time, so stuff like this happens. Just an FYI, I have 3 kids mind you and spend a lot of time with them and their friends. You are making a generalization of a group of people and I doubt its right, over all, there should be at least one kid realizing things are wrong as they are and would voice their opinion, hell, as a kid I would have skipped all the kids and just go to the principal/teacher, I was taught that it was wrong to mock people for their looks and was never part of a big group to get into the mob mentality, and my kids are the same. As I stated before, maybe its a cultural thing but in my school days this would have not gone as it is right now. I remember a speech WAAY back in the day at my old Public Elementary School given by a livid gym teacher concerning a school fight that put 4 kids in the hospital. This speech (that most likely would never fly in the idiotic “P.C. Friendly” world of today) addressed alot of what’s going on right now in this comic. And for the record, it ENDED the problem.